Pain is something we all feel at some time in our lives. If we are fortunate, the source of the pain is treated properly, and the pain goes away relatively quickly. But sometimes, with pain that is difficult to manage, the discomfort can persist for months at a time. In those circumstances, pain comes to be seen as a disease in its own right. And often it can only be managed, not cured. Pain affects more Americans than diabetes, heart disease and cancer combined, according to a fact sheet from the US National Institutes of Health. It is the most common reason Americans access the health care system. Pain is the leading cause of disability, and the most common cause of long term disability. It is a major contributor to health care costs. The National Academy of Medicine estimates that pain affects more than 100 million people and costs $600 billion a year. We know the scale of the problem: the numbers of people involved, and the cost of managing their discomfort. The question is – can we reduce that terrible toll? Can we, the health provider and the patient, work together to find and deliver a better way of managing chronic pain? I believe we can. In my practice as a family physician, I’ve discovered some low-cost, highly-effective remedies that can improve the lives of people living with chronic pain. These are solutions that I, as a family physician, am happy to share with my patients, and these remedies can be used in addition to the conventional strategies for managing chronic pain. One of those conventional strategies is the prescription of opioids. Of course,we are all keen to see a reduction in the death toll from the overuse of opioids, but I’m getting ahead of myself. There are also non-opiod medications for chronic pain. First, let’s go back to the root of the problem: pain. How do we define and manage pain? Acute pain is the body’s reaction to physical injury, infection or inflammation due to tissue damage. The International Association for Study of Pain, in 1994, defined pain as “unpleasant sensory and emotional experience associated with actual or potential tissue damage”. In medicine we talk about pathophysiology, a term used to explain the processes within the body that result in the signs and symptoms of a disease. The pathophysiology of chronic pain is not well understood; nor is the significant impact of pain on the patient, and his or her physical, emotional, social and occupational wellbeing. These factors, in turn, can have a significant impact on a patient’s ability to overcome chronic pain. The prognosis, the course and probable outcome of the condition, is influenced by many environmental factors: nutrition, social supports, socio-economic status, exposure to drugs and substances, the patient’s state of physical and mental health before the onset of the condition, the patient’s attitude, and even genetics. Traditionally, chronic pain is managed by the use of analgesics, physiotherapy, massage therapy, occupational therapy, and psychotherapy. Opioids have become the mainstay of drug-oriented treatment. Unfortunately, in Canada in 2016, there were 2,800 apparent opioid-related deaths. According to the Public Health Agency of Canada, if this trend were to continue, up to 4,000 lives were expected to be lost for the same reason in 2017. The US Centres for Disease Control and Prevention reports that in the US 63,600 deaths were related to opioid overuse in 2016, and the estimate is 66,000 in 2017. As society, and health providers, we have to do a better job. It is well accepted that conventional management of chronic pain has limited success. So, let’s explore an option that I know to be highly effective – which can help reduce pain and reliance on pain medications. Yoga and meditation can be helpful in managing not just pain, but also the associated depression and anxiety that comes along with chronic pain. More than that, it can improve cognitive function deficits associated with chronic pain. A recent research done at Stanford University suggests that meditation and breathing practices could be the solution to overcome the opioid crisis. Neuro-imaging studies have shown that chronic pain can reduce gray matter in the brain. Decreased gray matter can lead to memory impairment, emotional problems, and decreased cognitive functioning. The practice of yoga can actually increase gray matter in brain. If we can increase our gray matter, we increase our ability to handle pain. Yoga practice may provide a protective effect in reducing the burden of depression and anxiety in these patients living with chronic pain.Yoga and meditation practice can also reduce pain sensitivity, leading to patients requiring less pain medication. Often when I say ‘yoga’, many shy away. They worry that they need to be flexible, agile, and fit to practice yoga. Nothing could be further from the truth. Yoga practice can be tailored to an individual’s needs. Meditation practice can be taught to anyone willing to learn. All you need to start yoga or meditation is the willingness to begin; a willingness to try something new. And let’s face it, if you’ve lived with chronic pain for any length of time, you probably know that conventional pain management is not always effective. So, what do you have to lose? I believe we should be offering to teach yoga and meditation to our chronic pain patients, to improve their quality of life. These practices are effective, and they can give us a low cost, highly effective way of improving the lives of people living with chronic pain and its associated problems. What is more heart warming than that now yoga, breathing and meditation practices are widely accepted by the medical community? There are courses where health care providers can learn these powerful ancient healing techniques and earn the Continuous Education Credits too. This content is not intended to be a substitute for professional medical advice, diagnosis or treatment. Always seek the advice of your physician or another qualified health provider with any questions you may have regarding a medical condition. 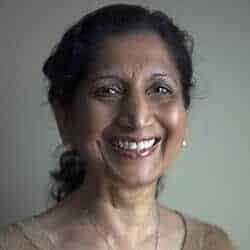 Dr. Bharti Verma is the President of Duffus Health Centre, and has varied experience in all aspects of family medicine, including long-term care, obstetrics, geriatrics, pediatrics, psychotherapy, and counselling. She is also a senior instructor in yoga and meditation with Art of Living Canada, and was Vice-President of AOLF Canada from 2010-2017. This article first appeared on artofliving.org.